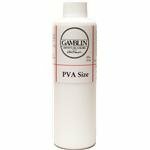 Before we get into the review of Gamblin PVA Size, lets briefly examine what sizing is. Sizing the canvas is an important step in preparing the canvas for oil painting. Despite its importance, it is often overlooked by many artists working today. The purpose of a sizing is to seal the fibers of the canvas. This prevents oil from seeping into the raw canvas. Over time, oil can deteriorate the canvas, and cause long-term issues for the integrity of the painting. Sizing is a thin solution that is brushed onto the canvas. It soaks into the fibers and dries. Once is dry, it can be covered with a ground before the actual painting is started. Gamblin PVA Size is a product that is meant to be used directly from the bottle onto raw canvas. It is available in both 8 ounce and 32 ounce sizes. When it is wet, is has a milky white color, and a very thin, watery consistency that is easy to brush on. It is designed to protect the canvas from oil penetration. PVA stands for polyvinyl acetate. It is probably most well known as white glue or carpenter’s glue. The Gamblin size is mixed with water to make it thinner and able to soak into the canvas. This provides an almost invisible layer of protection, that has very little effect on working properties on the surface of the canvas. This is because it is so thin that it doesn’t create a layer that sits on top of the canvas. One of the best things about Gamblin PVA Size is how easy it is to use. It be used directly from the bottle and applied in a thin coat. I recommend mixing it before use as the product can settle and separate depending on how long it has been sitting. Compared to other products like rabbit skin glue, it is a much more straightforward process. There is no measuring glue/water ratios or heating that is involved. It is also very easy to clean up. Brushes can we washed in water. PVA size is often recommended because it is non hygroscopic. This means that once it is dry it won’t absorb moisture from the air. This is a common problem with traditional sizes. The absorption of water can cause the canvas to contract and expand, which can make the oil paint crack (or worse) over time. For this reason, many older paintings in museums are removed from the canvas they are on, and re-lined onto more stable supports. Another great benefit of this product is that it is incredibly thin. This means that a bottle can cover quite a bit of canvas. If two coats are applied, as I usually do, then you will find that the second coat has even more coverage. This is because much of the first coat will soak into the canvas. When the first coat has dried it will already have “sealed” the canvas. The second coat won’t soak in as much and can be spread out further. There are a few minor problems with this product that I have found as I prepare canvases for oil painting. The first is that because of it’s white color and thinness, it can be difficult to see where it has been applied. This is especially true on cotton canvas. The color of the PVA size soaked canvas and the dry, uncoated canvas are very close. So you really have to pay attention to where you are applying it. I usually scrub it in with the brush as I apply it to ensure even and full coverage. I also usually apply a second coat once the first has dried. This way, if I missed a spot on the first, then hopefully I will cover it in the second coat. I have noticed, especially if the bottle has been sitting on the shelf for a while, that the product can separate slightly. I think that this is the heavier PVA glue settling on the bottom and the lighter water rising to the top. To make sure that the Gamblin PVA size is properly mixed, I usually give it a good shake before I apply it. The bottle recommends that it be applied before the canvas is stretched. I haven’t found this to be too much of an issue, as I apply it on a large area of canvas, then cut out pieces to fit the stretchers I will be using. There are several other products that can be used to size a canvas before painting with oil. The first is a traditional product that has been used for centuries. This is Rabbit Skin Glue, which also soaks into the canvas fibers and prevents the oil from rotting it. Rabbit Skin Glue is usually sold in small pellets that need to be dissolved in water and heated. This can be a time consuming and finicky process that can take some time to perfect. Once the heated rabbit skin glue is brushed onto the canvas it actually shrinks the canvas. This has the added benefit of creating a surface that is drum tight. This provides a stiff surface to work on. In fact it can stretch the canvas so tightly that it can warp inferior stretcher bars. Even though it has been used for hundreds of years there are some downsides to using it. Rabbit Skin Glue remains hygroscopic. This means that it can absorb moisture from the environment. This can cause the canvas to tighten or slacken depending on the ambient humidity of the room that painting is stored in. This tightening and loosening of the canvas can have a negative effect on the oil paint film. It can cause cracking and even delamination (where the paint actually falls off of the canvas) over time. Another issue is that it can be less flexible than some of the alternatives when it is dry. This is okay if your painting canvas will remain stretched or mounted on a panel, but it could pose a problem if it is going to be rolled. Another option that can be used as a canvas size it an acrylic polymer product like Golden GAC 100. GAC 100 is applied much the same way as PVA size and acts in a very similar fashion. One difference I have noticed is that GAC 100 is slightly thicker then Gamblin PVA size, so it doesn’t brush on quite as easily. 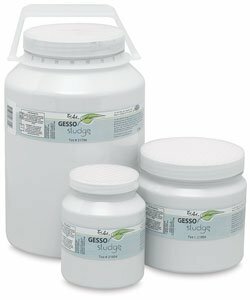 Another alternative is to simply use an acrylic gesso like Golden Gesso to size and prime the canvas in one step. The downside to this method is that several coats are required to ensure that the oil paint doesn’t soak through to the canvas. This is commonly practiced by many artists, as it only requires one product for a size and a ground. One concern is that adhesion between oil paint and an acrylic ground might not be as strong as the adhesion between oil paint and an oil ground. PVA size can also be made by mixing archival PVA glue with water. This method will achieve similar results to the Gamblin product. It does require an extra step in measuring the appropriate ratios of glue to water. Mixing to achieve a consistent result will also be required.